Should they be removed? When and why? Wisdom teeth or third molars are the teeth furthest away in the dental arches and they are usually the last ones to erupt… if they ever come out! For their eruption to occur normally, there must be sufficient growth at the back of the jaws to accommodate these teeth. For most people who have all their permanent teeth, this happens rarely and wisdom teeth fail to erupt. Growth of the lower jaw occurs mostly at the back and this growth is essential to allow the eruption of the third molars (circle). If growth is inadequate, wisdom teeth will remain impacted. It is very rare to see someone with the maximum possible of 32 teeth in the mouth (including wisdom teeth) that are optimally aligned and functional. Teeth that have not completed their eruption within a reasonable time are called “impacted” if they are completely submerged under the gum and “semi-impacted” if they pierce through the gum only partially. The dental community agrees to recommend the extraction of third molars that are symptomatic or cause problems (pain, infection, damage to other teeth, etc.). But what about impacted teeth that are asymptomatic? Wisdom teeth have historically been blamed for many problems. They are accused, among other things, to cause tooth movement by exerting pressure on other teeth when trying to erupt. This would be responsible for the movement of other teeth and the increase in dental crowding and rotation of the anterior teeth with time. Is this “popular belief” justified? Studies have shown that, although they may play a small role in these tooth movements in late adolescence and later, they are not the main cause and several other more important factors, such as residual growth must be considered. Even when third molars are extracted, it is common to see anterior dental movements occur thereafter. Therefore, several associations of dental professionals (orthodontists and oral and maxillofacial surgeons) have concluded that it is inappropriate to extract third molars only to prevent unwanted dental movements. However, a semi-impacted tooth or a tooth presenting signs of pathologies represents a risk of serious problems. 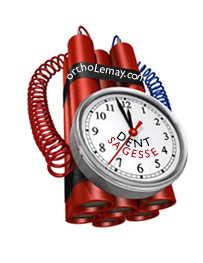 Such a tooth can be compared to a “time bomb” in the patient’s mouth; you don’t really know when it will “explode”! Examples of impacted third molars that can only be seen with the help of radiographs. There are, however, several other reasons to extract third molars. For example, if they have symptoms, such as pain, infection, have caries, are difficult to clean, have a severe malposition, etc., it is best to remove them. It is almost always indicated to extract a tooth that is “semi-impacted” because it presents a higher risk of infection and decay in the mid or long term. In summary, it is frequently indicated to extract wisdom teeth that do not come out, but the reason is mainly to solve a problem already affecting these teeth or to prevent the development of pathologies (cysts, tumors, resorption (wear) of adjacent teeth). Extraction is not intended to prevent the movements of other teeth over time. Although both lower third molars of this 24-year-old woman are partially erupted, they are partially covered with gum tissue (semi-impacted) and difficult to clean. They have become decayed within only a few months of their eruption (arrows and dark areas on X-rays show decay). It is preferable to extract these third molars before the problem worsens. However, if you prefer to keep asymptomatic impacted wisdom teeth, do not ignore them. It is strongly recommended to have regular radiographic assessments made (every 3-4 years) to detect the onset of potential problems as described above. Symptoms affecting third molars can occur long after the appearance of a problem and, at that time, significant damage is often already present and irreversible. Note that it is rarely necessary to extract third molars as part of an orthodontic treatment. However this may be necessary if, for example, those teeth would interfere with the normal eruption of another molar (second molar) or prevent the movement of teeth towards the back of the mouth. 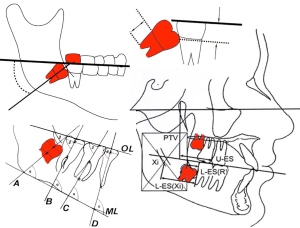 Another exception would be when a jaw surgery, such as a mandibular advancement, is planned (orthognathic surgery). In such a case, the oral surgeon will prefer to extract the lower wisdom teeth at least six months prior to the surgery in order to avoid a “bad split” of the mandible during the surgical intervention. We like to use the “jack-in-the-box” analogy to try to describe certain unpredictable dentition problems and behaviors. Wisdom teeth are well suited for this comparison; it is hard to predict if they will come out and if so, how and when. They are full of surprises! Impacted upper and lower third molars leaning against the second molars in a 21-year-old male. 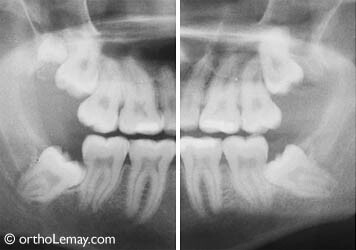 There are even 2 upper wisdom teeth on the right radiograph! These molars will not erupt and can damage other teeth. Upper third molar eruption problems. Only a radiograph can detect this anomaly (25-year-old woman). These teeth will not erupt adequately and their extreme malposition justifies their extraction. 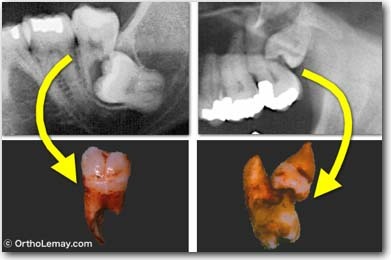 The tooth on the picture on the right can damage the second molar if it stays in the mouth. A routine radiograph in this 13-year-old patient reveals impacted lower wisdom teeth that are almost not formed but overlap the roots of the second molars, which could damage them in the long term. It would be indicated to extract them before the formation of their roots is too advanced. Note that such situation can be asymptomatic for the patient. The main way to assess the presence and position of third molars is to take a panoramic radiograph and evaluate certain factors, such as the size of the teeth, the formation of their roots, the direction of eruption, the available space, the jaw bone, etc. In an attempt to predict the eruption of third molars, several methods have been developed. Some are very ingenious and original, but none has proven to be accurate every time. Some are very simple while others rely on fancy calculations of tooth position and evaluation of future growth. But… despite the availability of several analytical methods, predicting which teeth will erupt adequately or not is sometimes just a lucky guess! 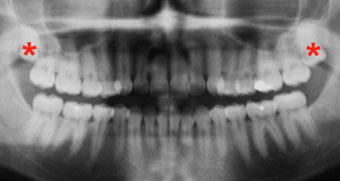 Look at the following examples of radiographs that show the behavior of wisdom teeth over many years. Who could have predicted what happened? Note: The letters represent the patient’s initials and the numbers are the patient’s age at the time the radiographs were taken. Evolution of the position of lower wisdom teeth during a 6-year period. As soon as the teeth will obviously not come out properly, it would be preferable to extract them to avoid a more complex intervention (extraction) later on (for the patient and the surgeon). (A) At 15 years of age, the lower wisdom teeth are already tilted forward. (B) 3 years later, the teeth tip more forward. 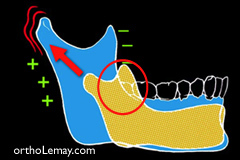 There is not enough growth at the back of the mandible to allow the impacted molars to upright and erupt. It would be indicated to extract these molars at this time because it is impossible for these teeth to come out properly. The upper wisdom teeth continue growing, but the left one stays blocked behind the second molar. (C) At 21 years of age, the lower wisdom teeth are positioned horizontally, which will make their extraction more complicated. (D) Upper right third molar once extracted. (E) Upper left third molar. (F and G) The lower third molars had to be cut in several pieces to be extracted. The maxillofacial surgeons’ skills still allow the extraction of teeth in a very bad position, but these extractions are a lot more complex for both the patient and the surgeon. It is thus preferable to extract impacted wisdom teeth as soon as they are considered to have no chance whatsoever to erupt and before the impaction worsens and makes the intervention more difficult. It is indicated to extract wisdom teeth that have no opposing tooth (*) in the lower arch, even if they erupt. When a tooth is partially out, the gingiva covering it is an area where plaque and food debris can accumulate and cause infection, inflammation and tooth decay. It is then indicated to either uncover such a tooth by removing the excess gum tissue or to extract it if the tooth cannot be properly uncovered to help it complete its eruption. A semi-impacted third molar is more difficult to clean which makes it more susceptible to dental caries. This tooth shows an incipient carious lesion in the surface groove. Sometimes, the clinical examination gives the impression that the eruption of wisdom teeth occurs well or normally, but the radiological examination reveals a whole different reality. (A) The lower right wisdom tooth of this 24-year-old woman came through the gum tissue several months before, but its eruption does not seem to progress anymore. (B) Although this tooth appears to erupt normally, a radiograph reveals the severe horizontal malposition of this tooth. 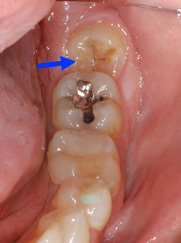 The visible part in the mouth (circled) is in fact the back of the tooth that is tipped forward. This semi-impacted tooth will certainly be problematic one day (infection, cavities, etc. ), so it is indicated to extract it. As described previously, the reason to recommend the extraction is not the risk of seeing this tooth displace the other teeth in front of it, but rather the fact that it could get infected and cause problems in this area of the mouth. When a wisdom tooth has little chance of coming out and another tooth in front of it is severely damaged to the point where major restorations will be necessary later on, it could be logical to extract the damaged tooth and “recuperate” the wisdom tooth. In such a situation, it is beneficial to postpone the decision to extract a third molar if an orthodontic treatment is envisioned. Extracting the wisdom tooth would force the patient to restore the damaged tooth or replace it if it were to be extracted eventually. Not having extracted an impacted wisdom tooth very early made it possible to recuperate it and eliminate a severely damaged molar. (A and C) 15-year-old teenager with a lower left molar (black * asterisk) that is severely compromised by a root canal treatment. Extracting this molar made it possible to recuperate the impacted and tipped wisdom tooth (red *) and close the space remaining following the extraction by moving the other molars forward (arrow). (B and D) After the corrections, the space created by the extraction is completely closed, the wisdom tooth (third molar) came out, uprighted and is now functional. The green asterisk (*) indicates where the wisdom tooth was. This patient thus avoided the necessity to have a crown which, since he was very young, would have required to be replaced several times throughout his life. Do all third molars need to be extracted? Sometimes, a single wisdom tooth seems problematic and must be extracted. What about the other third molars that stay in the mouth? Should they necessarily be extracted as well? To learn more about it, consult our Ortho-blog column “Do all third molars need to be extracted?” describing certain points to take into consideration to decide which wisdom teeth need to be extracted. The behavior of wisdom teeth is hard to predict. It answers a very complex “equation” with several variables. Each of them can influence individually or together the symptoms and evolution of the eruption of teeth. Many studies have concluded that symptom free wisdom teeth do not always mean disease free teeth as there are many types of infections which can be developing over time around these teeth. Very often he decision to extract or not it is a judgment call on the part of the practitioner but when you look at the pros and cons long term, it is probably safer to extract borderline problematic wisdom tooth instead of hanging on to them in the hope that nothing happens. 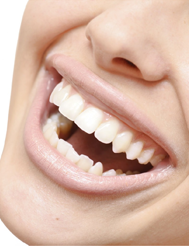 Dental crowding is a normal and unavoidable phenomenon throughout the years. The age at which it will occur, the severity of crowing and where it will occur may vary from one person to another and this will happen whether an orthodontic treatment was performed or not. The teeth that are most often affected are the lower anterior teeth (incisors and canines), but all the other teeth may move as well. Wisdom teeth have often been blamed in order to try to find a cause to undesirable tooth movements or displacements that occur after the end of an orthodontic treatment. Numerous researches and studies were published on this subject, but the conclusion from the most serious sources is that the third molars that erupt at the back of the dental arches do not significantly cause these displacements. To learn more on orthodontic retention and the influence of wisdom teeth on the stability of teeth.